Boat owners know they have 4 choices when it comes to storing their boat: in a high-and-dry, on a trailer, on a lift or in the water. Each has benefits and drawbacks. In-the-water storage gives you the easiest and quickest access to your boat and on the surface appears the cheapest–or is it? 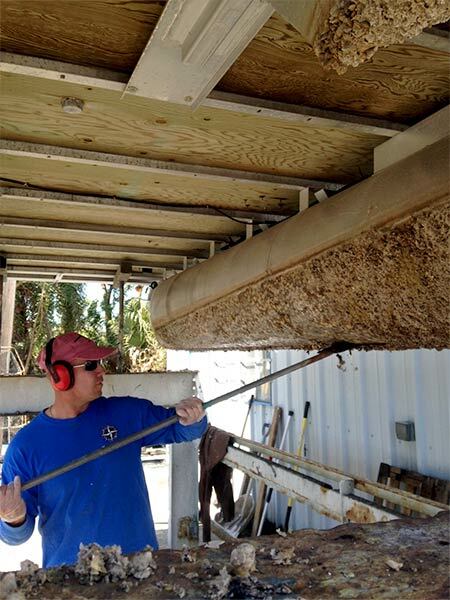 Keeping your boat in salt water, here in Florida, means that in a matter of a few days–or a couple weeks–you’ll have organisms growing on and into the hull. The only way to prevent this is with the use of bottom paint. Bottom paint usually contains copper or another substance which prevents the organisms from reaching your hull. Most folks use an ablative paint which acts like a bar of soap in that the paint is designed to wear off your hull from either use or scrubbing and when it wears off it takes the growth with it. This means your paint needs to be replaced periodically (most manufacturers only warranty their paint for 1 year). Different hulls require different preparation and products. An aluminum-hulled pontoon boat will be destroyed if we apply a copper based paint directly to the aluminum so we use both an aluminum protection product and an epoxy coating to protect your boat from the bottom paint and then we apply two coats of bottom paint to protect your boat from the water. 3 different products and 5 coats go on all bare aluminum-hulled boats. Fiberglass boats need to be de-waxed and then lightly scuffed with sandpaper to give the paint a surface to adhere to. 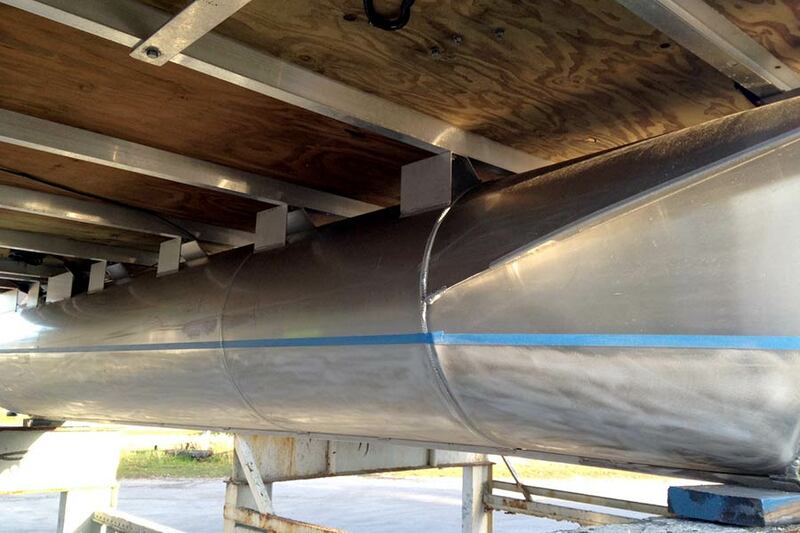 A usual application for fiberglass hulls involves 2 products and 2-3 coats. Many folks make the mistake of waiting too long between paint jobs, or they leave the boat sitting too long (remember, an ablative paint needs to wear off through use or scrubbing). 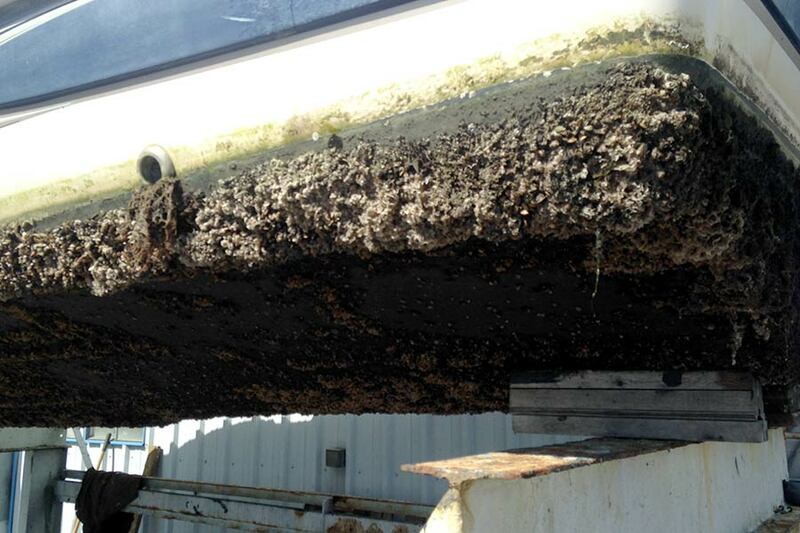 We’ve had some boats come in with over 4 inches of barnacle growth all over the boat. We can’t paint over any growth, it all needs to be scraped and ground off. Sometimes corrosion has already set in and we need to either patch holes in aluminum or repair blisters in fiberglass. Though the products and techniques we use to protect your boat are the same, no two paint jobs are alike because of the most important element of the paint job: preparation. Our prices are based on two factors: (1) the paint, and (2) the preparation. a boat with 4 inches of growth and corrosion can take up to 12 hours. We can generally look at your boat out of the water and give you an accurate estimate of the prep time. Want to try bottom painting yourself? You can buy the paint from us, and you should buy a Tyvec suit, full face respirator, chemical resistant gloves, 2 different roller handles, 6 rollers, painter’s tape, boat blocks (have fun lying on your back with your hands over your head for the next 14 hours), a scraper, 80 grit sandpaper, a pressure washer, tools to remove your zincs and a whole bunch of water or gatorade. You’ll quickly learn the job isn’t fun and no price is too high to pay someone else to do it, especially in the summer. Here’s an example of a boat covered in barnacles. Let’s get to work! Here is that same boat after we’ve scraped and buffed off all of the barnacles. The tape is part of the prep-work before the bottom paint is applied. Give us a call today, or at least bring the boat in and let us estimate the work load for you.